Kye’s First Day of Preschool! Zach and I decided to start Kye in preschool this fall for many reasons. The main one being we knew we’d be getting pregnant and wanted Kye to have something just for him. Yes, alone time with the baby will be nice for me (but in actuality the way the schedule will work out Blitzen will typically be sleeping the whole time Kye’s gone haha) but we both felt it was very important for Kye to have something fun to look forward to instead of being stuck at the house with a stressed out mommy and crying baby all the time. After much pro-and-con list making we decided to enroll him at Carpenter’s Kids Preschool (the reasons we chose C.K.P are on this post! ), he’s in the 2 1/2 year old class even though he did not turn 2 1/2 by the cut off date. He’s for sure the youngest but Kye does well with older children and we can always keep him in that class again if we feel he’s not ready to move up next year. I got a school schedule when we went to one of our meetings there and worked on getting Kye adjusted to that schedule over the summer. Up until now he’s always eaten lunch at 11:30 but we slowly moved it back to noon with a small snack at the same time school does it (10:30) if needed. I love all the cute book bags in Pottery Barn and knew I could find a good deal online, but I thought it was important for Kye to get to choose his book bag. It’s a big step in his life and I like allowing him to have some say in things 🙂 We went to a little store in town and I picked out about 8 book bags I’d be okay with him having (no tractors, sissy looking ones, etc). I laid them all on the floor and let him pick. He quickly picked up a fire truck one then when I was at the check out counter he ran up to me and said “Mommy I want a different one!” He ran back to the book bags and picked out a transportation one with a train, cars, and a plane on it. I thought it was cute how sure he was that THIS was the one! The Friday (Aug 5th) before his first day of school we had open house. Luckily Zach was able to go with us and we made a BIG deal about going to school. Kye has only ever been to Bible Class so he doesn’t really know what school is so I told him he’d get to play with new friends, on a play ground, and play with lots of toys. What kid wouldn’t want to go there? We pass his school alllll the time on the way to Zach’s parents house so we always say “Hi School!” I was thrilled when the info packet came in the mail and I found out that Autumn is his teacher. She was in the delivery room with me when I had him and took all the pictures for us, has done several other photo shoots with us, and will be in the delivery room with Blitzen! She is an awesome mother and is THE main reason I wanted Kye to go to C.K.P (isn’t it funny how the school and Kye share the same initials?). How lucky did we get that she’s Kye’s teacher?!? Not only do I trust her completely but Zach and I know she won’t hesitate to let us know if there are any behavior issues we need to deal with! The week leading up to school we started putting Kye to bed earlier. He’s stopped sleeping late for naps so the only way to make sure he’s getting all the rest he needs is an earlier bedtime. We bumped him up to 7 instead of 7:30 since he has to get up at 7 on school days. I was pretty nervous about the adjustment of getting both Kye and myself ready every school morning in time to leave by 8:15 but it’s worked out okay so far. I was hoping to do roomtime/video time during the mornings but often he eats too long for breakfast and there just isn’t time so I’ve found it’s easier for me to just get up earlier (at 6:30) so I can be ready to go and only have to worry about him. I had his clothes picked out (and ironed) the night before for the first day and made sure we would be PLENTY on time!!! He was SO excited and I really think the Open House helped prepare him for his big day. He loved wearing his book bag and didn’t want to take it off! Here’s Kye’s first ever First Day of School pictures! This is seriously one of my most favorite pictures of him EVER. Can you tell he was just ready to go? Drop off took like 5 seconds. We walked him to the room, gave him kisses and he was GONE! Off to play with the toys he had remembered from Open House. The mama in me wanted to linger a minute but I know it’s best for him just for us to leave so that’s what we did. I was really surprised how okay I was. Then I got home. Sure, I was looking forward to three hours of “me” time but my house was empty. And quiet. And lonely. I started BAWLING my head off. Like embarrassing type crying! I couldn’t even edit pictures or blog because seeing pictures of Kye made me cry. I had a pity party for about 10 minutes then just spent the time lazing around waiting to go get him. Shauna, our preacher’s wife, told me once that our job as mothers is to raise MEN (or women) and that’s what I kept reminding myself. If I tell him I’m sad or show those emotions to him then that hinders his growth. Going to school is a GREAT thing for him and a positive thing on his journey of life. It’s selfish of me to want to hold onto him and keep him at home and keep him my baby. It’s not what’s best for either of us even though it’s what I was totally wanting!!! I know him being at school was something he’d love and something that would help us both. It helps Kye learn social skills that I can’t teach him here, prepares him for sharing and things with his sibling, and gives him an outlet that all of his own. It also helps me have time to rest/prepare for Blitzen and get used to my whole life NOT being about Kye allllll the time. Come December it can’t be so this transition is one I need just as badly as Kye does (if not more!). I was very eager to pick Kye up and was one of the first ones in line outside the building to go in (shocker). He ran right to me and was so happy! I wanted to ask 1,000 questions from Autumn all about how he did, what they did, etc but I just smiled and thanked her and we left. Then I asked Kye the 1,000 questions I wanted to ask Autumn haha. It was SO funny because we got in the car and I kept asking “what did you do at school today? was it fun? did you play with friends?” and Kye just said “no Mommy don’t talk to me.” Typical, typical BOY. I immediately thought of Zach and how Mrs. Charlotte would drive him NUTS asking him too many questions. So I stopped and just took him home and let him tell me little things as he wanted to. He LOVES school. I’ve heard a few stories from Autumn too that make my day! The first day I guess he kept going up to her and saying “hey guys, what are you doing?” and another time it was his turn to pray and the other kids kept on talking so he said “guys guys listen to Kye!” He earns a sticker or stamp every day if he’s good and so far there hasn’t been a day without a good report. He told me recently that he got timeout (which we don’t do at home so I KNOW it was from school) because he yelled. Of course I want to go to Autumn right away and ask her what happened, but I know they handle it and if there’s something I need to know they’ll tell me. It’s HARD to let go of that control!!! 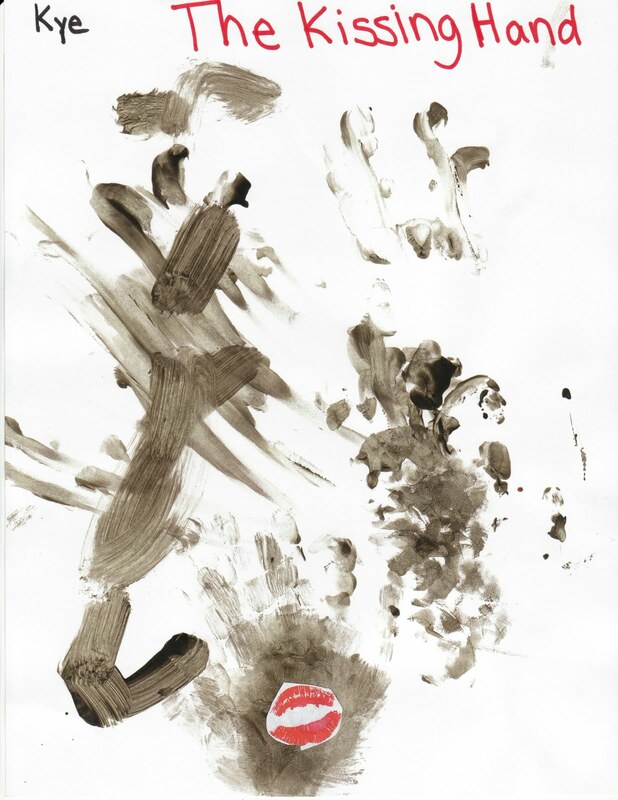 Here’s his first EVER piece of artwork from school! Great pictures! Great memories!Shauna's insights are wise – we are raising men and women. And each transition is emotional. I think that is ok. Even good.We just took our youngest to college 12 hours away. She wanted to know if we were going to cry. How can you not? Each transition is emotional, but they are also healthy, for both the kids and the parents.Cheryl and I are discovering that empty nest is actually quite nice. Great post Emily! I know it makes you feel so good that Kye is doing well and enjoying school. It always makes our decisions as parents easier when we see that our kids are having a positive experience. That way we know we are doing the right things! Logan is the same way about school. None of the kids want to leave at the end of the day. That also says a lot about the teachers and the environment. It makes me so happy to see them loving to go and be at school and learning so much! Awesome decision! And it is really ironic about Kye having the same initials! LOL!!! Thanks! We try very hard to b intentional parents so im glad it shows!